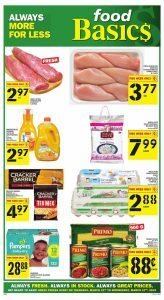 Food Basics Flyer Daily Deals 24 Mar 2019 is the perfect choice for everyone. Let’s fill your fridge and do not spend too much. Food Basics flyer provides always good and lower prices. Enjoy your shopping experience all week long. Do not forget to combine your coupons with all those deals.